Your junior year GPA is very important to your college applications next year. Please don’t let this easy final adversely affect your GPA. This assignment allows you to succeed while helping people that are less fortunate that you. Helping other people is our goal. Some of you have been struggling with the creation of your storyboard. I have created a list of elements that I will be looking for when I grade your final (The PSA). Does your PSA have the qualities to capture and keep the attention of a young person? Does your PSA bring useful information that is correct and data driven? Does your PSA express where the young person can seek help or further information on the health topic? Ie. A hotline, school nurse, specific organization, wellness center. If you are seeking the extra points for a social justice connection you would need to show why one group is affected and make a fairness claim. What the viewer can do to not fall victim of this health issue (prevention) or how they can limit harm (risk or harm reduction) or both. Hello Galileo Health Academy Juniors. The last round of research will be due next Tuesday (April 9th). I am posting this assignment today if you want to get a head start on it this weekend. Becoming the expert – Understanding the problem – who is already doing what (existing organizations and their strategies) and what are the results? 1. Find three organizations that address your topic? 2. What services do they provide to clients in order to address the issue you are researching? 3. How does one access their services? 4. Do they address issues other than the one you are researching? Ps. Don’t forget the interview and/or mentorship document on the Health Academy webpage. If the hyperlink below does not work cut and paste into a browser or go to the GHA website. You need to demonstrate competence in each assessment in sequence order from yellow through to pink. There is one exception. You can take the Detailed Physical Examination Assessment (Red) at any time through the written test. If you get 100% on the written test you still cannot proceed to the Ongoing Assessment (Pink) before proving competence in all previous levels (Yellow, Turquoise, Purple, and Blue). If you look at those that are at the red level you will see they have a post-it note indicating they need to prove competence in one of the lower levels before moving on. 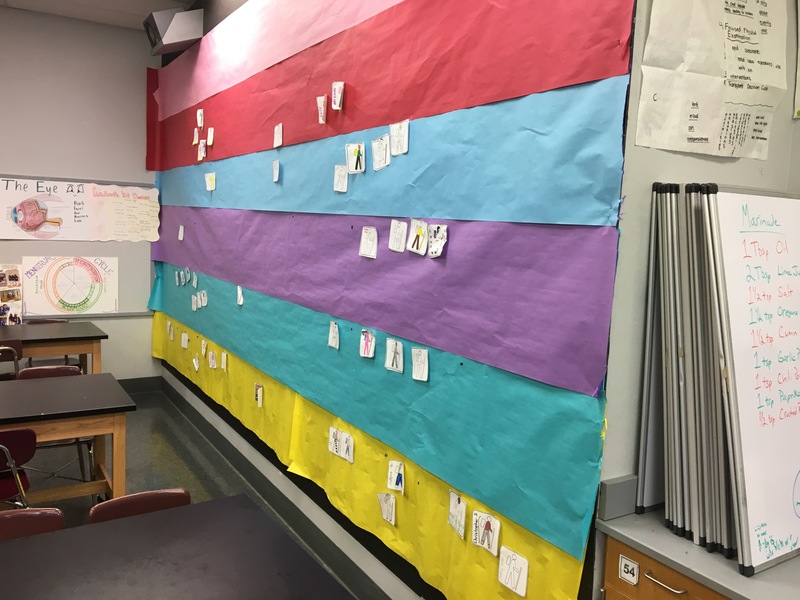 Each color on our back wall represents one of the six assessments you need to know. To pass this grading period everybody should be at the pink level by Friday January 25th. Those that do will receive their full 144 point. Next week I will open my class at lunch three times for anybody that needs to retake or make up the Detailed Physical Examination Test. 100% is required to pass. There are 48 questions. Each question is worth 3 point for a total of 144 points. If you scored 138 points on the last test, you only missed 2 questions. You need to score 144 to pass the test and to make it through the red level. Please check the results of your first test on Synergy. ** Competence of all six assessments is required to deliver appropriate patient care and to pass the first grading period. There are eight people who have demonstrated competence in Detailed Physical Examination by scoring 100% Gabbi, Derrick, Jessie, Sophia, Caroline, Emily and Amy.